A great way to sweeten hot and cold beverages, fresh fruit and more. • Great for sweetening hot and cold beverages, cereal, fresh fruit and more. Made from sugar so it tastes like sugar. A great way to sweeten hot and cold beverages, fresh fruit and more. Excluded are Alaska, Hawaii, Puerto Rico, APO/FPO, PO Boxes and International locations. 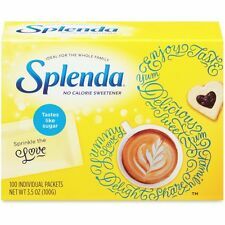 Splenda Sweetener 16 oz. Bulk Canister. Sugar Type Sugar Substitute. 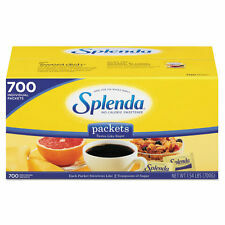 Splenda Packet "Pkg Of 2000" - 2.8 Gram Individual Serving Packet. Splenda Sugar Substitute, 1.0g, 100/BX. Also great for sprinkling on cereals, fruits and anything that needs extra sweetening. No Calorie Sweetener. Tastes like sugar, made from sugar, but it's not sugar. On rare occasions and despite our best efforts, an item be defective. Available in French Vanilla flavor. If the item didn't arrive properly we will do the best service to fix it for you to be satisfied. Also great for sprinkling on cereals, fruits and anything that needs extra sweetening. No Calorie Sweetener. Tastes like sugar, made from sugar, but it's not sugar. A great way to sweeten hot and cold beverages, fresh fruit and more. On rare occasions and despite our best efforts, an item be defective. Check-Out Process. Cook, bake and sprinkle with no added sugar. 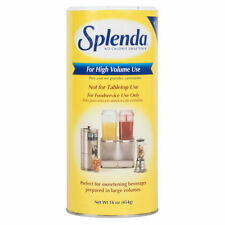 With Splenda® No Calorie Sweetener, you can significantly reduce the calories and carbohydrates that sugar adds. NE, NV, NH, NJ, NM, NY, NC, ND, MP, OH, OK, OR, PW, PA, PR, RI, SC, SD, TN, TX, UT, VT, VI, VA, WA, WV, WI, WY.